Jerry Belson grew up in Lafayette, Louisiana, one of eleven children. He attended Southern University in Baton Rouge, majoring in music education and a member of the famed Human Jukebox Marching Banduntil the Army decided it wanted him marching for them in Vietnam. Jerry joined the U.S. Air Force instead, and served in the Armed Forces Police in Wiesbaden, Germany, where he and his wife welcomed their second son into the world. After returning to the U.S., Jerry explained, he joined the National Park Service (NPS) “because I needed a job.” Why the NPS? While picnicking at Amsted NRA one day, he saw an African American boat ranger on patrol. Having never seen a black park ranger before, he was intrigued and went to talk with him. The ranger, wise to the ways of the government, told Jerry that as a Vietnam Era veteran he could get a park service job. This encounter led to Jerry becoming a survey technician with the NPS Denver Service Center. He then accepted a permanent position in maintenance followed by becoming a law enforcement park technician and then district ranger, all at Amistad. 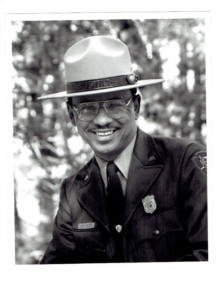 Respected for his ability and calm personality, he regularly led special law enforcement details when important dignitaries visited parks in the NPS Southeast Region, honing his leadership and interpersonal skills as a result. Meanwhile, he completed his college education with a degree in criminal justice. Jerry’s ability and personal demeanor led quickly to his promotion to chief ranger at Tuskegee Institute and later superintendent at Fort Frederica. He also served as superintendent of the Martin Luther King National Historical Site. While there, he had the privilege of working with Coretta Scott King in designing and establishing the park visitor center and strengthening the bond of respect between the NPS and the King family. Heading west, Jerry served four years as deputy superintendent of Yosemite. While managing the day to day operations, he led the park’s response to one of the most notable and destructive fires in park history in the early 1990s. But the one action of which he is most proud was hiring Shelton Johnson, now the nation’s most prominent Buffalo Soldier interpreter and star of the Ken Burns PBS series on national parks. Jerry’s leadership abilities led to his next assignment as superintendent, Southern Arizona Group and two years later as the first African American regional director for Southeast Region, where he served until his retirement in 2004.He led the establishment of the Tuskegee Airman National Historic Site and the Selma to Montgomery National Historic Trail and was proud to march across the Edmund Pettus Bridge in Selma with Congressman John Lewis and Coretta Scott King, respectfully helping lead national recognition of the Civil Rights movement. Jerry’s vision combined with his practical outlook, broad smile, and personal demeanor both in and out of uniform, his empathy for peers and subordinates, his pride in the National Park Service, and his efforts to diversify its ranks together exemplify his caring hands-on trusting leadership style so respected by those who knew and worked with him.